X1 sold less per week in march then april.....PS4 still won NPD. MS got to be hurting, putting all your hopes on one game was always a foolish strategy, not sure why MS thought a limited always online game would do much for x1. been saying that for months people called me fanboy and what not, it was common sense. Not to mention that most of those 40 million PS2 sold outside of developed world. If Sony gets PS3s price down I don't see why they couldn't repeat that at least to smaller degree (Extra 15 million?). it could, but sony would need to discount the platform to $150 and $100. actually, that should have happened years ago. Should have happened, but I think Sony has made a calculated decision to let it sit at this price for as long as possible and then kill it. I think their costs are simply too high to really go any lower. ~218k for Titanfall bundle is a good number, but I expected more for overall sales. Something more close to 400k than 300k. I think we need to establish a new metric for selling really really well. People say "why do publishers set such unreasonable expectations," but it is because they spend unreasonable amounts of money. I think we should evaluate sales more like publishers do, and see whether the sales justify the level of investment. And in that arena, it's clear Titanfall dramatically underwhelms. Selling ~2m units is normally admirable, but not when the marketing spend is as positively huge as it has been for Titanfall. And in that arena, it's clear Titanfall dramatically underwhelms. Attach rate is incredible, the game sold extremely well in US. Sales on 360 and worldwide totals we don't have yet. I know this sounds so strange but is 1M+ really a good number? Square were complaining about Tomb Raider only hitting 3.4M in it's launch period and that's last gen. Did Titanfall have a much smaller buget than Tomb Raider? Personally I'm not surprised if Titanfall underperforms expectations. Controlling giant robots is a nice gimmick but is always going to be a tough sell to the wider mainstream. Average consumer would just filter it out similar to how they filter out niche Japanese mechs. It's good for Respawn to have the deal for Titanfall 2 but EA/MS will likely be looking to cut the development and marketing budget as much as they can so it could struggle and Respawn will have a tough time convincing anyone to sign them for a third game(whether Titanfall 3 or something else). The game had 26 days for NPD and hardware sales are down week on week. That's with any bundling and offers that were happening. This suggests it didn't attract people that don't already have an XB1 and it also thus suggests the game may not have strong legs as hoped. I guess 360 and PC sales will compensate perhaps. So did Lightning Returns get outsold by FFX/-2? New AAA IPs are expected to lose money as they establish a base. Tomb Raider wasn't a new IP. And Titanfall really was probably a low budget game compared to most AAA titles. They used the source engine to make development easier at the cost of graphics and honestly kept the amount of content extremely compact, with limited maps and modes. Exactly, TF will be fine, especially if the sequel hits PS4/X1/PC and Respawn fixes up their mistakes from the first one (plus, hopefully a bigger team). It won't be COD like EA wanted it to be, but I'm sure Titanfall 2 will improve dramatically over TF. I feel like "really well" would be about 1.75-2 million and "really really well" would be 2.25-2.5 million. In a universe where they were wanting to split the Call of Duty crowd, a more convincing opening salvo is what people expected. Having played it for a good while, I think the popularity of the game will grow as people get Xbones (is that term okay yet?) and the 360 version gets the good word out. I think it has good legs, as well, it has a lot of people in for a long ride so far - we'll see, though. It is probably the most highly polished next-gen game that's been released so far so I would think it will stay in the top ten for a while. I think EA should be happy with the sales, but Titanfall wasn't about being happy. They told us, and their investors, that it was their next-gen Manhattan Project. It sold good, but not 'Gears of War' good. Gears was close to a 40% attach rate in the US, and solidified it as a mainstay franchise for the entire generation. That's a shinning example of what a 3rd party exclusive can do. In comparison, Titanfall sold 1 million out of 2.5 install base for approximatly 40% attach rate, and....wait, nevermind. Titanfall number sounds great. But I think MS and EA had much higher expectations. The game's hype and marketing started almost a year before the game released. I still remember how crazed the media was about it. But the game didn't manage to sell X1 units. And when it did, it included the game for free. Xbox One install base is 2.5m in US. ~1.1m is "really really well"
I thought 1.1mln in march was the ww number? Eh I highly doubt Titanfall itself cost all that much to make it was for the most part made in a year. Setting up Respawn however was expensive. The only ones that'd be disappointed in this is Microsoft, not because of the games sales but in the amount of consoles it managed to move.There's a very high chance EA made bank. If US is around 60% for MS then that would suggest Titanfall launched around 1.5M. Any estimates for what it did on PC and what it will do on 360? What about estimates through to year end? According to the "Final Days of Titanfall" - Respawn blew through the initial 30 million from EA with nothing to show for it. EA was set to pull the plug and Respawn made a deal with MS. Now we don't know the amount of the deal, but I'd guess it had to be more than $30 million since they blew through that with nothing done. I don't think we can say Titanfall was low budget - probably not AAA budget, but not cheap to make either. A look at the PAL charts will show that X1 TF was pretty much DOA outside the UK. The US counts for way more than 60% in this case. The problem is Sony won't be able to get the PS3's price down. The fact that there are new PS3s for $300 is insane. To really get big in developing areas Sony needs to drop the price down to $100, but the system isn't engineered with that in mind. Seems more than a little disingenuous lumping those 200k+ Titanfall sales from bundle systems in with regular sales when comparing against previous titles that it was aimed against competing at such as Gears of War. Microsoft was literally giving Titanfall away for free with the bundles. I actually can't even fathom why only 70% of the systems sold were Titanfall bundles. Even for somebody with no interest in the game they could throw it on eBay - made even easier if it was just an online redemption code. In any case lumping them together implies that Titanfall is the reason those systems sold. Yet since fewer XBones were sold week for week in March than February that leads to some awkward logic with one having to claim the system selling period for the game happened before its launch. And this is enters the realm of facepalmingly bad disingenuous when starting to compare things like attach rates. Aside from Super Mario Bros and the NES I can't actually recall the last time any console gave away a flagship product like this for free during its launch window. The fact that the XBone sold less in March than February is a strong indicator that Titanfall being packaged in likely had relatively little to do with those sales. I've said for awhile that Titanfall would probably perform like Gears of War when looking at sales potential. But even then, I still think it will influence other titles in terms of game design. I think things like burn cards and the movement system will be mimicked by others quite a bit this gen.
That's from 3 years ago with the EA Games President mentioning that Titanfall will given a 2 year dev cycle to get their game built and "polished to maximum quality." In that discussion they also openly stated planning on Titanfall competing with games like Gears of War and Halo. Gears of War released on a single system from a developer with no major console reputation. It ended up selling around 6million - with more than half of that coming in the first 10 weeks. Titanfall was planned to be released on all systems, including as a next gen launch title, and is coming from the developers behind the single most popular shooter on consoles. Putting their sales estimates (and thus their invest levels) at 10million units sold in the lowball range is I think going to be a very conservative estimate. And that was assuming a normal 2 year dev cycle. Of course this was also with no intentions of simply giving away the title along with massive discounts on it a month after release. I'd be fairly surprised if Microsoft is taking a 100% hit (or in other words if EA is getting 100% their normal return) on every bundled TF copy. I really can't even fathom how EA feels about TF right now. They really did seem to play things a lot quieter. It was Microsoft chest thumping and gorilla ground pounding about the game from the top of their lungs. All we do know is that EA signed on for TF2 before the sales results for the original even came in so they obviously see a future in the franchise. Not sure I see where you're going with this. The Titanfall bundles were also $450. So your choices are a sim racer that released months ago, was met with lukewarm reception and the poorest metacritic of the series - or the biggest and latest release. 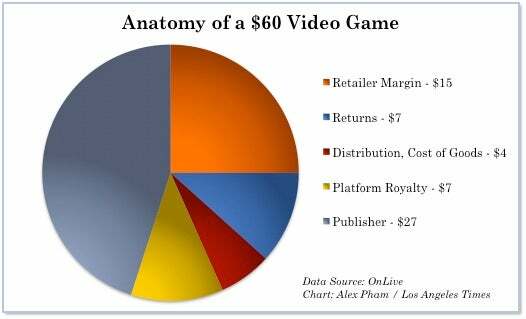 Right, and 1 million sales is about what you would see from a not low budget but not quite AAA game. Well... it was designed with that in mind. It was intended to be another PS2, selling 150 million units, validating BluRay and Cell. BluRay took off, Cell became an interesting CPU diversion. I have little doubt it's because Cell became something only Sony uses that's slowed PS3 price reduction. Given how long they've had it at or around $300 I doubt it will ever get much cheaper. And it will be quietly phased out for the PS4. Probably the most intelligently designed console of all time. No eccentricities, all components that will see drastic cost reduction in very little time. Not as powerful as it could have been, but a nice trade off for consumers and Sony. It's almost like things changed? And with them expectations? Putting their sales estimates (and thus their invest levels) at 10million units sold in the lowball range is I think going to be a very conservative estimate. And that was assuming a normal 2 year dev cycle. Of course this was also with no intentions of simply giving away the title along with massive discounts on it a month after release. I'd be fairly surprised if Microsoft is taking a 100% hit (or in other words if EA is getting 100% their normal return) on every bundled TF copy. What possible reason is there to believe that EA isn't getting almost equivalent revenue from those bundled copies of TF? I think EA is perfectly happy with how TF turned out. With what was potnetially going to be a complete write-off is now basically a low risk return for EA. They didn't have to pay for marketing and their costs paying to develop it are going to be somewhat offset by MS's exclusivity deal. If MS saved Titanfall, why was the producer guy surprised to see it became an exclusive? Because the cost of 'saving Titanfall' was originally a year's of timed-exclusivity. One year is long-time. Realistically, it was more than sufficient for MS to sell TF as an exclusive game and a system-seller with just that period of exclusivity. That makes sense. I'd forgotten it was a timed exclusive previously. putting it like that, it doesn't seem like it bombed, tbh. a new basically always online IP did half of a huge established IP's 6th or so game. Lack of easy piracy will hurt its hardware performance imo. Most people in, for example, South America had chipped PS2s. I saw very little PS2s playing original software. I mean, people could buy a chipped PS2 straight out of some electronics shops. If you went to a hardware shop in the Lands of the Jolly Roger asking for any console, they'll offer the chipped version. You have to specifically ask for an original console otherwise. That's how much those market leans towards piracy. With that being said, while I don't see the return of PS2-era heights from the Jolly Roger, I expect PS4 to outperform PS3 there, for the reason being that consumers from those regions are starting to see that their dreams of easily piratable consoles are practically dead in this day and age. PS3 took an insanely long time before it was jail-broken, and even then, piracy was not easy because BD. And then 3DS and Vita are showing no signs of being jailbroken anytime soon. The market will mildly calibrate towards accepting that the dream is dead,,, mildly. Most will just go back towards the King of Pirates, PC. Yeah, I was going to make the same point that it's a bit unfair to compare console sales alongside a new IP with console sales alongside IPs that were already very well established/popular. Overall, very interesting month. Neither Titanfall nor Infamous raised the sales of their respective systems as much as I thought they would (especially Titanfall). Titanfall selling so much though (#1 software sales spot) shows that there were a good number who bought Xbox Ones before Titanfall released to play Titanfall. People obviously got Xbox Ones after Titanfall's release to play the game (bundle sales) but (again) there were many who also bought the system to play the game before it released. Looking back on it, it makes sense considering how long Titanfall has been hyped. The game was hyped months before the Xbox One was released and got a lot of good feedback so it's not surprising that many bought an Xbox One before the release of the game to play it. It's a "system seller" in the sense that it helped to sell consoles but it wasn't in the way many expected it to be (huge increase in XB1 sales for the month of its release). Having a new, online only IP sell so well in its first month is good though and bodes well for the console that it's on when it comes to game support (which is why I find it puzzling that people are saying there's a "Wii U like" situation for the Xbox One right now) but MS definitely needs to make some changes. These next few months are going to be really interesting. Expecting sales for both Xbox One and PS4 to drop these next few months up until the Fall which will see many blockbuster titles (exclusives and multiplats). Really looking forward to E3. Edit: And thanks again for the stats Aquamarine. It would be embarrassing for MS if the Xbox One doesn't do better than the PS4 for March NPD. Not sure what you are trying to say. It was embarrassing for MS to lose March NPD with the advertising hype of Titanfall alongside the bundle (and various deals). The game still sold well though. Tomb Raider was selling to a customer base of well over 160M, Titanfall wasn't. Titanfall has probably sold 1.5 million WW which isn't too far from Infamous' 1 million in absolute terms. 360 SKU is now out so it would be interesting to know the entire LTD. I think you missed the point of the very first comment: That's from 3 years ago with the EA Games President mentioning that Titanfall will given a 2 year dev cycle to get their game built and "polished to maximum quality." The point is that EA was funding the game expecting it to be selling on every console and be done in 2 years. Instead it was done in 3 years and sold on a fraction of the consoles available. Instead of launching to an audience of 150million+, it launched to an audience of around 3 million. That already means basically all "happy scenarios" are dead. MS likely did not cover anything resembling the costs of the PS3/PS4 sales lost. As has been mentioned in here the doritos 'n dew media rep stated in his e-book (and if that doesn't scream reputable source then I don't know what does!) that EA was about to cancel the project. The deals of the agreement between EA/MS have been kept air tight, but EA's profits before Microsoft stepped in were going to be a loss in the tens of millions. MS was in a position of power and the final deal is going to reflect that. And these deals were made before the next gen launch. The XBone ending up doing poorly relative to the PS4 is just salt in the wound. I think the situation is more like EA thought they won the mega lotto and are just waiting to cash it in. Instead it somehow turns out they won just enough to cover the cost of their ticket with maybe a shake on top. Still a winner, but nobody's going to be happy there. Titanfall did really well but they could have had 2.5M+ sales instead of 1M, if EA wasn't EA. Of course they will be addressing this issue with TF2 next year. I think they were expecting the consoles to have more install base parity because of the trajectory of both in 2013. They probably also expected more of the XB1 install base to hop on board.EA being EA they'll probably do what makes them the most money. Well that about sums it up, doesn't it? The hype was artificially created by MS and their advertising money. Yes, the game sold well, but it didn't turn things around for them. It won't be remembered in the same way as Halo or COD4 or even TLOU. Have to say, though, the Titanfall deal was still great for MS. Considering the attach rate and how many people on here and elsewhere bought the XB1 over the PS4 just for it (over the last few months), its scary to think where the XB1 would have been without it. Soooo true. Ya, the XB1 isn't selling better than the PS4, but in the grand scheme of things, compared to the X360 and past console generations, the XB1 is doing fine. If there was no Titanfall though, the PS4 could have possibly outsold the XB1 here in the US 2 to 1 over the last couple of months. I would love to know digital sales of Titanfall on both the PC and XB1. All my gaming friends who bought the PC version of Titanfall bought a digital copy and I would say a quarter of my friends on XB1 who bought Titanfall bought a digital copy. I wonder if digital sales of Titanfall for just the XB1 version, could possibly be in the 200k range for March?? Then throw in the digital sales of the PC version and the overall sales picture of Titanfall could be quite healthy, ESPECIALLY for a multiplayer only FPS game. Unless there was some kind of single player component that was scrapped late into development, development cost of Titanfall were probably pretty low compared to other AAA releases with both a single and multiplayer component. The stat tracking for Titanfall is pretty bare bones, no major CGI, mo-cap or voice acting in Titanfall and it shipped with only four game modes. Even with all the money spent on marketing and even if Titanfall sells in the 3-4 million range across X1/PC/X360, MS, EA and Respawn could all be happy with returns on Titanfall and laugh all the way to the bank. Both valid points. I am by no means a technical expert but I have always thought that when it comes to getting price down PS3 was pretty terribly engineered. Split memory set up, exotic CPU, Nvidia GPU (at least if my memory serves me right Nvidia kinda screwed MS with the price of GPU with original Xbox too). For reference MS sold X360 under 199 back in 2008 already so it seems that X360 was by far better engineered in this regard (More common CPU, unified memory pool, GPU from ATI). I thought there were rumours though that this year Sony will get the CELL and RSX to same die so maybe with that they could drop the price too. Obviously part of the reason for high price at the moment is that they are just having high margins with PS3 (same with MS). When it comes to developing world Sony has one big advantage over MS and Nintendo though. Their supply network as a global eletronics giant. They have official presence in many countries where MS and Nintendo don't. When it comes to lack of piracy that obviously hurts but still I think that for some degree risen (and still rising) living standards in developing world are gonna offset that compared to PS2 gen. Piracy is interesting phenomenon though. I am not sure that completely stopping it benefits you that much. PS2 was easy as hell to pirate but it also sold software by far the most of any consoles before and after. At the same time piracy helped it to sell consoles in developing world and if some of those pirates bought even a one official game that was plus for software sales.